How to Use iPhone 6S Screen Mirroing (iPhone 6/6s Plus and Before)? iPhone 6/6s screen mirroring (6s plus) can set AirPlay mirroring destinations as Apple TV (4), Windows 10 PC, or MacBook Pro/Air, iMac (macOS Sierra): Between the two, screen mirroring iPhone 6 on Mac with 5KPlayer is in more frequent use in work place, also iPhone 6S/6S Plus models with 4K capturing, 3D touch and 16GB-up storage is on wild roll now. Here you have 5KPlayer to take you out: iPhone 6S/6S Plus has revamped mirroring performance with this freeware. Apple AirPlay doesn't natively support iPhone 6S screen mirroring to Mac and Windows(iPhone 6S Plus), but you can achieve iPhone 6s share screen with a freeware. With 5KPlayer to mirror iPhone to Mac Windows, there's no need to transfer files from iPhone 6S to Mac with USB cable. Screen Mirroring iPhone 6S/6S Plus hands-on renders successful information exchange without occupying a single byte. In the matter of pushing pixels, iPhone 6S screen mirroring (iPhone 6S Plus) function of 5KPlayer never shrink back. With iPhone 6S/6S Plus topping the camera pixel rankings again - up to 12 megapixel probably, this nifty helper can not hinder: The screen mirroring iPhone 6S iOS 9 function of 5KPlayer has revamped in real terms to ensure lossless experience when you use iPhone 6s share screen. Sure indeed, being able to handle the best mobile camera pixel, or even up to 4K streaming, screen mirroring of 5KPlayer can easily mirror iPhone 6/iPad to Mac, or screen mirroring iPad Pro 2 without glitch. Apart from it's excellent performance to mirror iPhone screen, 5KPlayer boosts good utility to download 4K 5K 8K HD videos from YouTube and 300+ video sharing websites. The tagline new function of iPhone 6S/6S Plus iOS 9 is to add 3D Touch to it - which is an awesome tool when you use music streaming services like　Apple Music streaming on iPhone 6S/6S Plus. Taking this momentum, 5KPlayer integrates the screen mirroring with iPhone 6S/6S Plus 3D Touch: You can use Apple Music to download music files to iPhone 6S/6S Plus, then press to set up iPhone 6s share screen to Mac or Windows, alternative, you may AirPlay YouTube Music APP to enjoy good music. With this freeware installed on your Mac, the iPhone 6S screen mirroring suffers no video delay from audio. You get doubled fun by free streaming music and mirroring iPhone screen to Mac hassle-free! Mac and Windows installed with 5KPlayer - the free AirPlay receiver - can connect your iPhone 6s/6s Plus to play streaming videos. Launch 5KPlayer after you connect iPhone and computer to the same Wi-Fi, then you can enable AirPlay on iPhone (AirPlay icon won't appear without unless you launch 5KPlayer on computer). In the review of top 3 PC AirPlay receivers, it's easy to find the free software not only a widget featuring outstanding screen mirroring iPhone 6s/6s Plus based on Apple's AirPlay technology, but also a HD video player, and an online video downloader. Now switch to your computer to install 5KPlayer, put your iPhone 6s/6s Plus captured 4K videos for screen mirroring, let the computer screen tell out the amazing difference of iPhone 6s 4K capturing for you! Get DearMob iPhone Photo Manager to transfer iPhone photos to Mac/PC if you'd like to view them later on the bigger-screen display, 100% free and green, click to download the tool below! You can't reject this, AirPlay mirroring iPhone 6S/6S Plus of 5KPlayer achieves information sharing without taking up a single byte. You used to transfer music from iPhone to computer with iTunes or AirDrop, but with screen mirroring of 5KPlayer you are saved from the trouble: It deems the iPhone 6S/6S Plus to be an eligible data holder - after its RAM jumped from 512MB to 1GB, its storage jumped to 16GB up. So share information effectively by mirroring iPhone to Mac, it's all done with 5KPlayer within seconds, and it will be rendered flawlessly with no quality loss. After screen mirroring, your personal data remains clean and nifty, with zero data transferred to another device, and that's what screen mirroring iPhone 6S/6S Plus can do. Download 5KPlayer for Windows PC or Mac, install and launch it. This best free AirPlay for Windows free tool can replicate your video collection from PC to Apple TV fairly the precision of reality. Apart from that, it can enable your computer to receive videos music from iPhone/iPad/iPad Pro. 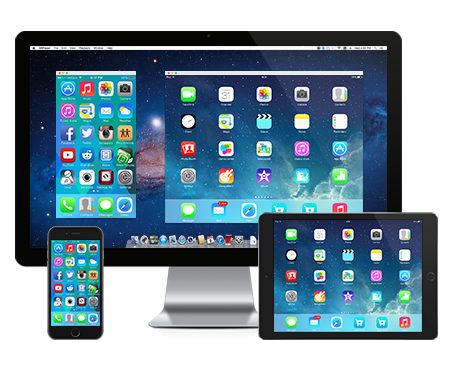 Step 1: Download to your Mac this free mirror APP for iPhone 6S/6S Plus. Double click to launch it. 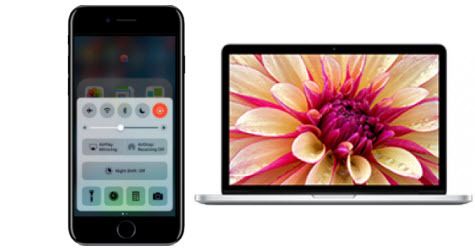 Step 2: Connect your iPhone 6S/6S Plus iOS 9 and Mac to the same Wi-Fi to enable screen mirroring iPhone. - You can also mirror one Mac screen to another with 5KPlayer installed on both. To activate screen mirroring iPhone 6S/6S Plus. - iPhone 6S screen mirroring of 5KPlayer instantly replicates the video and audio of iPhone 6S/6S Plus instantly to Mac, to disable the audio, use the volume adjust bar. How to Record iPhone 6s/6s Plus Screen and Save? As one of the best screen recorders for iPhone, making it possible to capture your iPhone 6S/6S Plus movements and voices as well, is by far the first free overture provided. Step 1: When mirroing is enabled, click the red icon on Mac/PC to begin screen recording iPhone 6s/6s Plus. 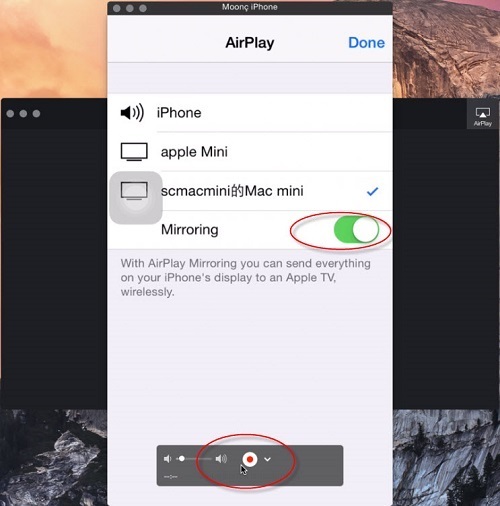 Serving as an AirPlay Mirroring server, 5KPlayer is not only dedicated on screen mirroring iPhone 6S/6S Plus to suffice, screen mirroring Mac/Winodws is also within its range. Those tricky functions that customers need, but can't expect from Apple, have been included into 5KPlayer's upgrade content. For further reading please refer to how to use 5KPlayer for free iPad screen sharing and how to AirPlay iPad Pro to Mac. You can't reject this, AirPlay mirroring iPhone 6S/6S Plus of 5KPlayer achieves information sharing without taking up a single byte. You used to transfer music from iPhone to computer with iTunes or AirDrop, but with screen mirroring of 5KPlayer you are saved from the trouble: It certainly is the best way to play iPhone on TV: Now that iPhone 6S/6S Plus is an eligible data holder - after its RAM jumped from 512MB to 1GB, its storage jumped to 16GB up. So share information effectively by mirroring iPhone to Mac, it's all done with 5KPlayer within seconds, and it will be rendered flawlessly with no quality loss. After screen mirroring, your personal data remains clean and nifty, with zero data transferred to another device, and that's what screen mirroring iPhone 6S/6S Plus can do.